Turkish President Recep Tayyip Erdogan exchanged Akhtem Chiygoz and Ilmi Umerov for the assassins of the editor-in-chief of the Kavkaz Center. Leader of the Crimean Tatars, Commissioner of President of Ukraine for Affairs of the Crimean Tatar people Mustafa Dzhemilev made a corresponding statement at a press conference in Kyiv on December, 12. “On October 25, two Deputy Heads of the Mejlis Akhtem Chiygoz and Ilmi Umerov were released. There was a lot of talk that some kind of liberalization would begin, Putin made a humane move - but in fact it turned out to be completely different," he said. According to him, Erdogan exchanged these people for two bandits who killed the editor of the Kavkaz-Center site. "After that, in a few days, four more Crimean Tatars were arrested and during their detention one woman was simply killed," Dzhemilev noted. He went on saying that collecting all the facts of human rights violations by Russia in the Crimea and complaints to international bodies are important steps for de-occupation of the Crimea. Deputy Chairmen of the Mejlis of the Crimean Tatar people demand the declassification of legal acts that affect their rights and freedoms. In particular, they intend to demand explanations through Moscow court from the administration of Russian President Vladimir Putin regarding the basis on which they were taken from Crimea to Turkey. Earlier, Deputy Chairman of the Mejlis of the Crimean Tatar people Ilmi Umerov commented on the response of Putin's administration to the request of the lawyer Edem Semedlyaev asking to provide a decree by the president of the Russian Federation, which served the basis for Umerov’s pardon. Ilmi Umerov wondered why he and Akhtem Chiogoz were sent to Ankara and transferred to the Turkish special services by deception and without informing them. 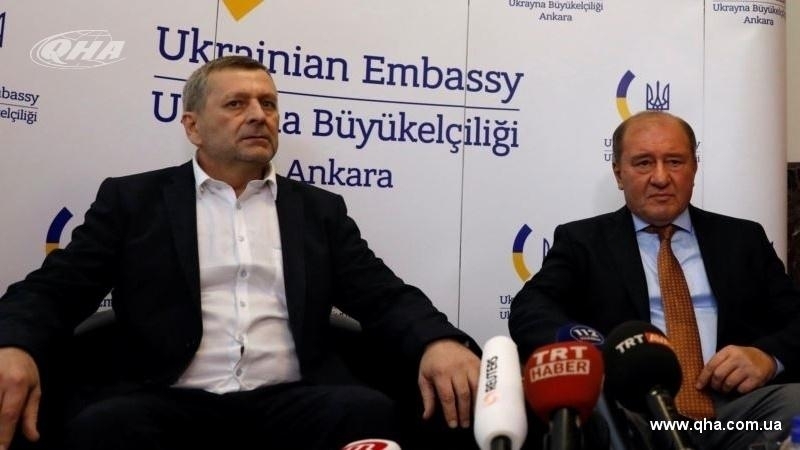 Reference: On October 25, Deputy Chairmen of the Mejlis of the Crimean Tatar people Akhtem Chiygoz and Ilmi Umerov convicted in the occupied Crimea were transferred to Turkey. The arrival of Chiygoz and Umerov in Kyiv was scheduled for October 26, but was later postponed to October 27. On October 27, Umerov and Chiygoz arrived in Ukraine. At the international airport Borispil they were met by the Head of the Mejlis of the Crimean Tatar people Refat Chubarov and the leader of the Crimean Tatar people Mustafa Dzhemilev. At the airport Chiygoz and Umerov gave a press conference. Later, the president of Ukraine awarded Umerov and Chiygoz with Orders for Merit.